Are you hungry? When I'm famished, I love being able to grab a quick bite that I can eat on the go. I want a choice that is convenient, tasty and won't break my diet. I'm excited about the McDonald's McWrap. McDonalds has brought back the McWrap. There are three flavors that can satisfy almost any palate. From savory to spicy, there is a combination for you. Each McWrap is offered with either grilled or crispy chicken. Here's what you can get. My personal favorite is the Chicken & Bacon McWrap. I usually have mine without the sauce. This wrap is very satisfying. It has become a favorite. 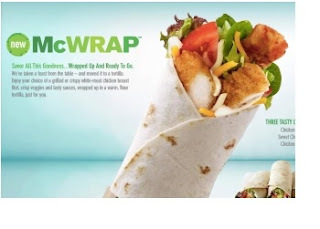 Would you like to try the McDonald's McWrap? I have 5 product coupons to giveaway. Please use the Rafflecopter to enter. Disclosure:I received coupons to use and to giveaway. All opinions are my own. Chicken and bacon! I would be like you and try it without the sauce. Chicken and bacon - YUM! Chicken and Bacon-no way to go wrong there! I would get the crispy chicken with ranch. Like to try the Chicken and Bacon McWrap! I'd like to try the Sweet Chili Chicken Chicken McWrap. I would like to try the chicken and bacon McWrap. I would like to try the Chicken & Bacon McWrap. The Sweet Chili Chicken Chicken McWrap! I would love to try the Chicken & Ranch McWrap: ranch sauce, seasoned rice vinegar, cheddar jack cheese, sliced cucumbers, and tomato. I'd love to try the Chicken and Bacon Mcwrap. Thanks so much. the chicken & bacon sounds awesome!! I'd like to try the Chicken and Ranch Wrap. The Chicken & Bacon McWrap sounds delicious. Sweet Chili Chicken Chicken McWrap! I want to try the chicken and bacon. I want to try the Chicken and Bacon McWrap. Let's start with Cx and ranch, please. I absolutely love the sweet chili wrap. I wish I could get that sauce for salads. thank you! I would like to try the chicken ranch. Sweet Chili Chicken Chicken McWrap sounds like me. Can not get Rafflecopter to come up. I would try the chicken and bacon.